Yes, attribute it to sexism when Clinton avoids answering questions, despite two recent reports which have demonstrated that she has been lying to the American people about major scandals for over a year. Both the the State Department Inspector General report and the FBI director’s statement on the investigation demonstrated that Clinton violated the rules in effect when she became Secretary of State, she acted to cover up her actions, and that many of the statements she has made since the scandal broke have been false. Fact checkers have pointed out how Clinton has repeatedly lied not only about the scandal, but about what these findings against her demonstrated. Anyone who is likely to become the next President should be willing to answer questions from the press. Someone tainted by scandals to the degree Hillary Clinton is should especially be questioned. That has nothing to do with her gender. It is a fundamental principle of democracy. Today The New York Times editorial board discussed the ethical issues involving the Foundation. I imagine that those in the Clinton camp see only sexism, and not questions of ethics. Emma Roller elaborated further on the Opinion Page. Is she also sexist? Even beyond the recent scandals, Hillary Clinton Clinton has a long history of opposing government transparency, along with a terrible record on First Amendment issues. Objecting to her record on government transparency and First Amendment issues have nothing to do with her gender. 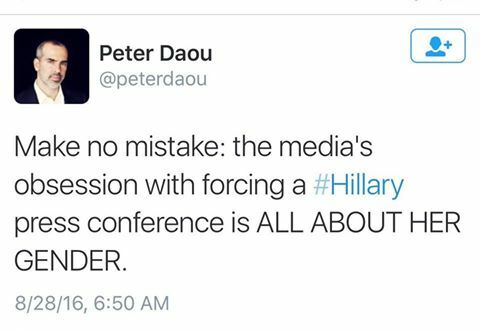 Daou acts as though Clinton is being singled out, but in reality both Clinton and Trump have been criticized by the media for the ways in which they are hindering press coverage. It has nothing to do with gender. Daou acts as though the criticism is all from sexist male reporters, but the criticism has come from journalists and others regardless of their gender. Last month, Carol Lee, president of the White House Correspondents’ Association, argued that both Trump and Clinton are a threat to press freedom. Again, her criticism has nothing to do with gender. Hillary Clinton is likely to become the next president despite having been wrong on virtually every major decision of her career, and despite Hillary and Bill having spent years playing fast and loose with the standards others are held to, both to increase their influence and to amass a huge personal fortune. It is no surprise that Hillary Clinton is not trusted, and that people believe she has a lot of questions to answer. Posted in Bill Clinton, Blogs & Social Media, Donald Trump, Hillary Clinton, News Media, Scandals. Tags: Bill Clinton, Donald Trump, Hillary Clinton, Peter Daou, Scandals, Twitter. RSS feed for comments on this post.. TrackBack URL. That neolib wingnut (sic) blocked me on Twitter long ago. Nothing lost. The last contact I can recall with Peter (who I knew from the days of the Kerry campaign) was when he called me in 2007 trying to get my support for Clinton. He even offered me the opportunity to meet Clinton in order (from his perspective) to see how we were for the same things. This showed how different our goals really were. Almost everything we opposed in Bush while supporting Kerry is also supported by Clinton.